Beads, beignets, crawfish and drinks, and bounce and brass await at this Crescent City-inspired crawfish and music fest. Food trucks will be on site throughout the day, and guests can pre-order crawfish or buy on site. Gates open at 11am. Admission Tickets are $25 for general admission. 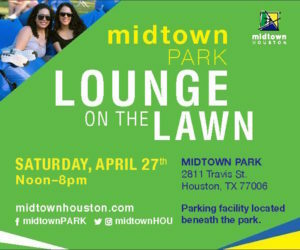 Enjoy a free, pet-friendly happy hour in Reliant Dog Park inside Midtown Park. This doggie play date features treats from Urban Tails, giveaways, contests, and prizes. Admission Free to attend. Click here for more information.